1. General features of an embryo appear before specialized features. 2. General features of an embryo develop before the most specific features appear. 3. Every embryo, instead of passing through the other forms, rather becomes separated from them. 4. Embryos of a higher animal only resemble the embryos, not the adults, of more primitive animals. Von Baer’s first two principles explain the development of animal embryos and contradict the notion of preformation, where a fully formed organism exists and grows from an embryo. The first principle states that general characteristics appear earlier than specialized ones, and so a general, homologous structure would exist in the early embryos of groups of similar species. This would infer these organisms had a common ancestor, and different species “branched off” from it. At similar stages of development, the embryos of birds, reptiles, humans and pigs have tails and gill pouches in similar positions. The second principle states that embryos develop from a simple structure to a complex organism. Von Baer argued against preformation with this theory, as it explains how embryos of similar groups of organisms developed in a similar way and differentiated from a similar structure, thus the organisms must be linked to a common ancestor. A defining and shared characteristic of vertebrates is the vertebral column, which is apparent in vertebrate embryos. In vertebrate animals such as fish, mammals and birds, the vertebral column develops first in the embryo, and then other specified features such as fur or scales form later. 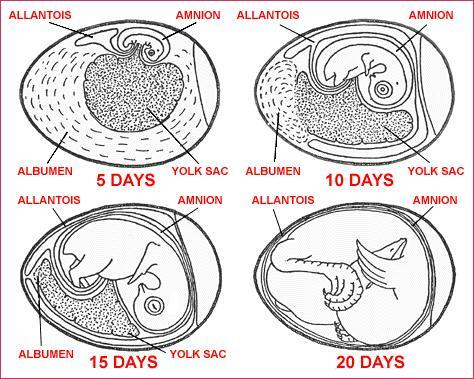 The following diagram shows that from 5 days, the vertebra of a chick embryo is distinct, but only after 20 days are the beak and wings distinct. Von Baer also argued against the recapitulation theory (explained below) with these principles. According to the recapitulation theory, early human embryos have structures like gill slits, so therefore early human embryos represent the form of adult fish, which also have gill slits. Von Baer’s third principle argues that the presence of gill slits in human embryos is because humans and fish have a common ancestor, therefore supporting evolution. The fourth principle that describes the resemblance of different embryos of higher and primitive ones reaffirms the idea that higher animals are related to primitive animals, and must have shared an ancestor. German biologist Ernst Haeckel proposed in 1866 that “ontogeny recapitulates phylogeny”. Basically, this means that the development of animal embryos follows the evolutionary development of the species. If this theory was true, it would mean mammal embryos develop into fish before they become mammals. Haeckel greatly exaggerates the similarities between embryos of different vertebrates in his drawings to prove his theory. His theory has been disproven by Von Baer’s four principles (1828) that specifically describe the relationship between embryos and ancestry.